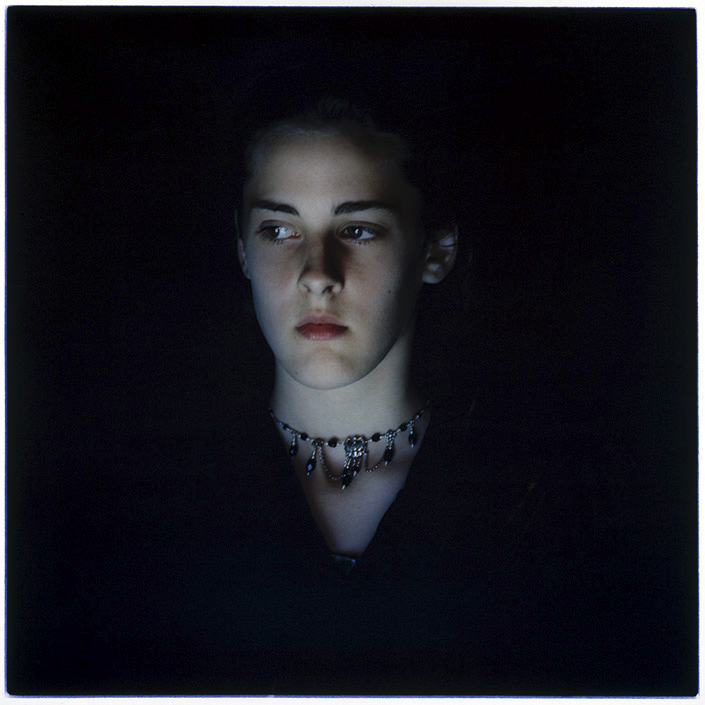 Gorgeous catalogue with luscious plates, insightful text by Bill Henson (below) and evocative poetry by John Kinsella. Stars on the front cover and silver edged pages. No expense spared in production, with money literally thrown at the project, or so it would seem. The curator, Helen Carroll, talks about ‘wonder’: “It is a capacity for wonder that makes us human”. Henson talking about ‘wonder’ and ‘love’ – about moments that change your life when looking at and breathing in great art. Then why does this exhibition feel so… well, needless? Despite some fascinating individual works of art, collectively there is little wonder on show here. Perhaps it is because this exhibition looks to be a cut down version of the one first shown at the Art Gallery of Western Australia in 2012, with many works missing from what are listed in the catalogue. 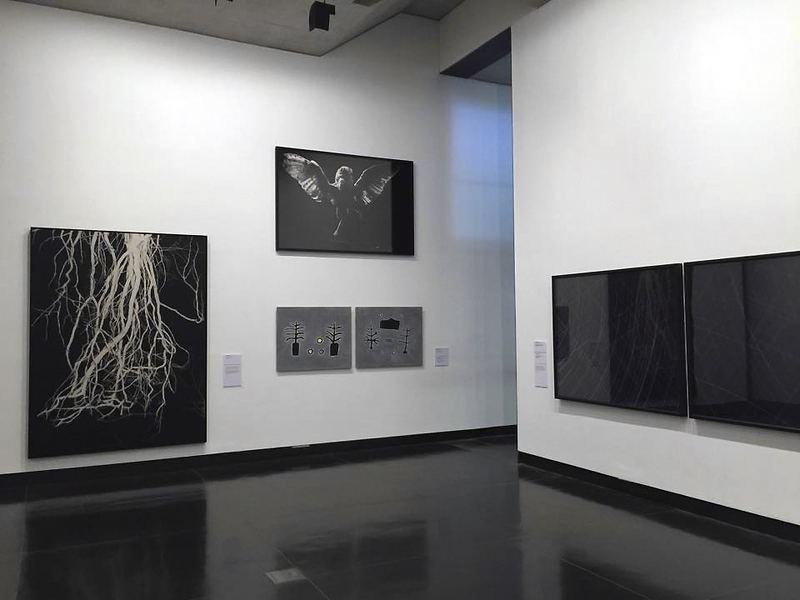 Or perhaps it is the hang which at the Ian Potter Museum of Art consists of two rooms on the ground floor of the museum, one housing lighter works, the other dark works. Too dichotomous for my tastes. Nothing is ever so cut and dried. Perhaps it’s the fact that the concept of the exhibition – light in its many guises – seems to have been tagged onto a groups of art works which are anything but about light. Or are about light in a roundabout, merry-go-round kind of way. The wall text states, “Rather than a chronological or stylistically ordered presentation, the exhibition follows a loosely intuitive flow of ideas and imagery, moving through night to day. The artists in this exhibition explore light from the perspective of the optical experience, the connection between the starts and the cycles of life on earth; and from diverse cultural, mythic and spiritual points of departure.” Apparently the works are more about the phenomena of light than about light itself. While the art works are interesting in their own right they don’t really work together cohesively as a group to investigate the theme of the exhibition. Trying to burden a collection of art bought for investment purposes with a concept not “natural” to the work, or just a curator’s idea of what seems implicit in the work but is just a cerebral construction, simply does not work in this case. As I looked around the exhibition, I felt the works were more about the physicality of time and space (of history and place), about links in the existential chain, than they were about light. For me, this evinced Mikhail Bakhtin’s notion of the ‘chronotype’ – meaning ‘the connectedness of temporal and spatial relationships that are artistically expressed’ (in literature). Perhaps the intuitive flow of ideas and imagery and the multiple points of departure work against the very idea the exhibition seeks to investigate. This is so broadly thematic (the effects of light on the world) that it needed to be more focused in its conceptualisation. The inclusion of New Zealand art because Wesfarmers has a significant business presence – not the quality or wonder of the art work – but a business presence. 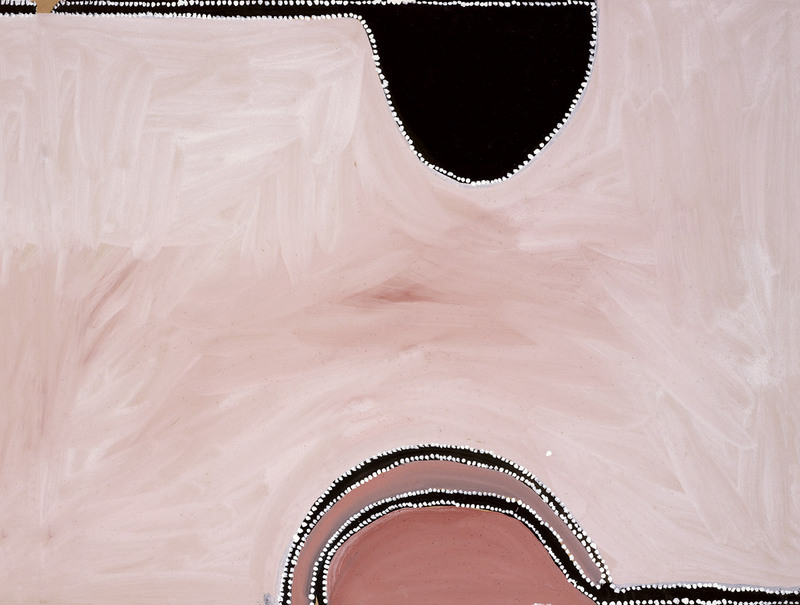 And only now are they collecting contemporary Indigenous art, after the collection has been in existence for more than three decades, 1977 being the first acquisition date. At least he is being refreshingly honest about why the art work has been added to the collection, but it does not give you confidence in the choice of the art work being displayed here. Goyder, Carroll and Kinsella also proselytize about the benefits of employee’s living with this art in their daily working lives and that may be the case. But for the casual visitor to the gallery this collection of art left me feeling cold and clammy – like a fish out of water. As the add for Reflex copy paper says with more humour than any of this work can muster, I didn’t find “enwhitenment”, or wonder, within the gallery walls. Oh, the luminosity of it all. Macbeth, Shakespeare’s most elaborate meditation on the night, is a sustained, if not obsessive, exploration of the nocturnal as a realm of alternative values – ones that contradict and threaten to undermine those of the diurnal regime that is ostensibly the domain of politics in the early modern period. In this violent, vengeful tragedy, the language and culture of the medieval night, incarnated above all in the witches, irrupts into the more enlightened languages and culture of a purportedly post-medieval epoch. An apocalyptic night, in Macbeth’s barbaric court, is one of the forces that shape realpolitik. In the Renaissance, a period in which daily life encroaches more and more on the night, especially in public settings, in the form of elaborately lit masques at court, Macbeth thus stages the limits of enlightenment. Matthew Beaumont. “What is the Night?” in Matthew Beaumont. Nightwalking: A Nocturnal History of London, Chaucer to Dickens. London and New York: Verso, 2015, pp. 86-87. 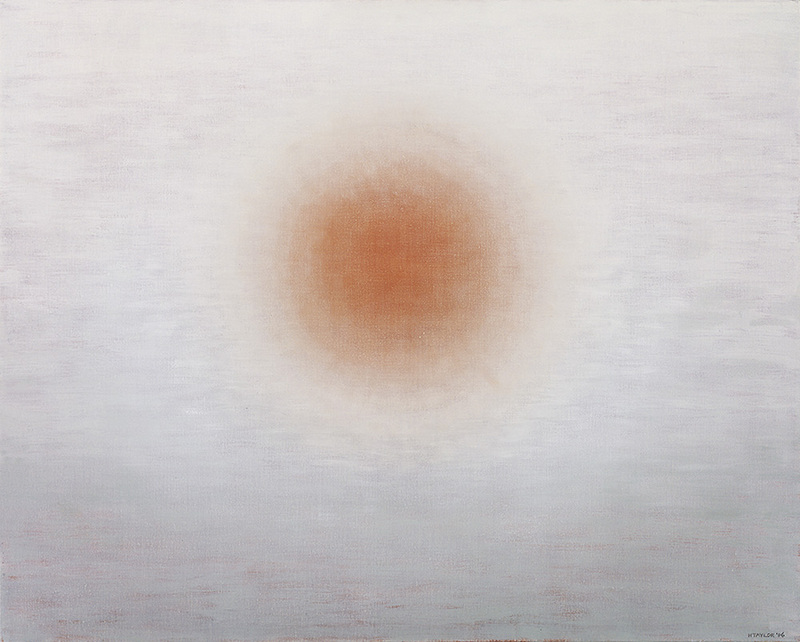 Luminous World brings together a selection of contemporary paintings, objects and photographs from the Wesfarmers Collection in a conversation about light. Through works of scale and conceptual invention that chart the range and depth of the collection, this exhibition presents significant contemporary paintings, photographs and objects by leading Australian and New Zealand artists acquired by Wesfarmers over three decades and shared together for the first time with the Australian public. The Potter is the fifth venue for this touring exhibition which to date has travelled to Charles Darwin University Art Gallery, Darwin; National Library of Australia, Canberra; Samstag Museum of Art, Adelaide; and The Academy Gallery, University of Tasmania. Brook Andrew (1970- ) is a Sydney born/Melbourne based interdisciplinary artist of Wiradjuri and Scottish heritage. Andrew’s conceptual based practice incorporates, sculpture, photography, installation, video and performance. The Replicant 2006 series reflects (literally) upon the act of looking, and consequent interchanges between nature and culture, subject and object, real and represented. These dualities fit broadly within the artist’s addressing of Australian identity, polemics and the politics of difference. 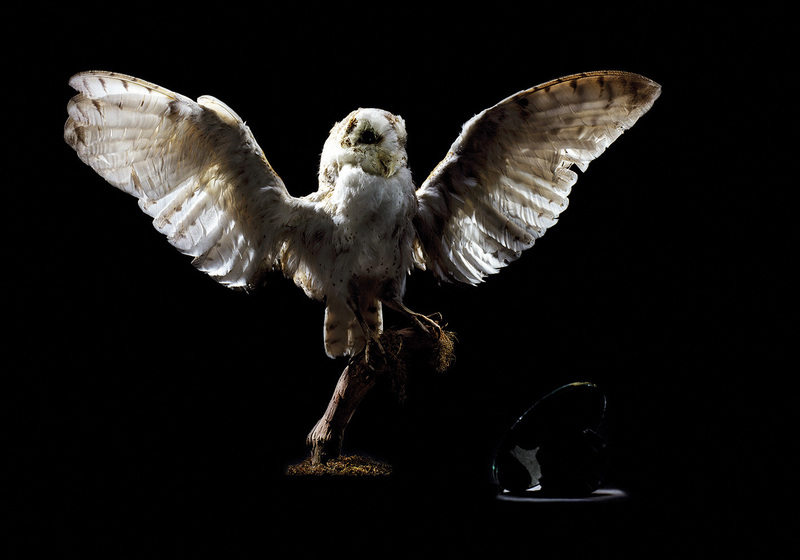 For the Replicant 2006 series Andrew borrowed taxidermied specimens from the education department at the Australian Museum, Sydney. These included native species of indigenous significance such as an owl, possum, flying fox and parrot. He shot each animal – artificially propped in their natural poses – and digitally manipulated each image so as to appear duplicated, a process that evolved out of the Kalar midday 2004 series. ” … And yet certain things – particular experiences that we have are excpetional. They stand apart from the rest of the general activity. What causes this apprehension of significance – of something in face powerfully apprehended yet not always fully understood? And why is it that all of us, at some time or other, with have this ‘epiphany’ – Christian or otherwise – in the presence of some work of art, in the experiencing of a performance piece or some unexpected encounter with the true magic of a particular piece of sculpture? When it happens, I always think of it as being as if one’s life – and everything that it contains – had just been ever so slightly changed, forever. Nothing, if you will, is ever quite the same again. What happens, I think, is simply that we fall in love – and it’s the apprehension of unexpected beauty that causes us to fall in love. The sheer force of such beauty can affect us as if it were an act of nature – and of course it is, for despite the arrogance of some theoreticians, culture is never outside nature. I think that it is this intense, if often quite subtle, love for the subject, and the resultant emotional and intellectual interdependence within that relationship – be it in musical form, something in the visual arts, theatre of dance – that is responsible for – and in fact makes possible at all – these great and fortunate encounters in the arts. Stare back into time and all kinds of very ‘personal’ things return your gaze. This has always, to me, seemed to a large extent to be what art is about. Sure, it’s personal, but it’s also millennial. The best art always heightens our sense of mortality. This is not morbidity that I am talking about – rather, we feel more alive in the presence of great art and this is because of a profound sense of continuity – our sense of being inside nature – is expanded. If you like, art suggests the immortal in all of us. When we listen to Michelangeli – or, say, Jörg Demus playing Kinderszenen – and we sense that simultaneously proximate and intimate yet utterly abstract presence (was that someone? Schumann perhaps?) and at the same time sense the unbridgeable gulf that exists between ourselves and that distant past – we know that we are in the presence of something magical. In the end I think that it is love that fuels this activity – that animates the speculative capacity in all of us – and heightens this sense of wonder. 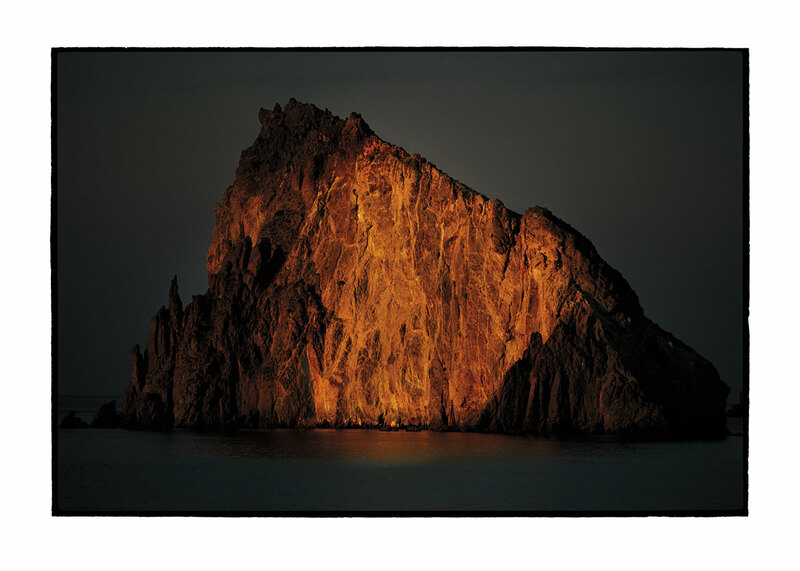 Excerpts from Bill Henson’s speech “Reflections,” in Luminous World catalogue. Perth: Wesfarmers Limited, 2012, pp. 23-24. 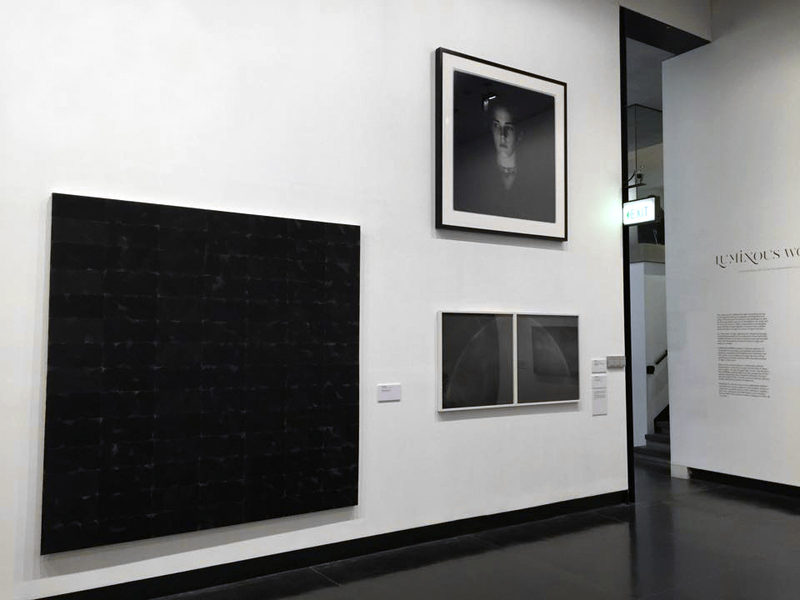 “Works focusing on light and darkness, and how light creates and reveals our world, from one of Australia’s pre-eminent corporate art collections compiled by Wesfarmers over the past 30 years, will be exhibited at the Ian Potter Museum of Art at The University of Melbourne. 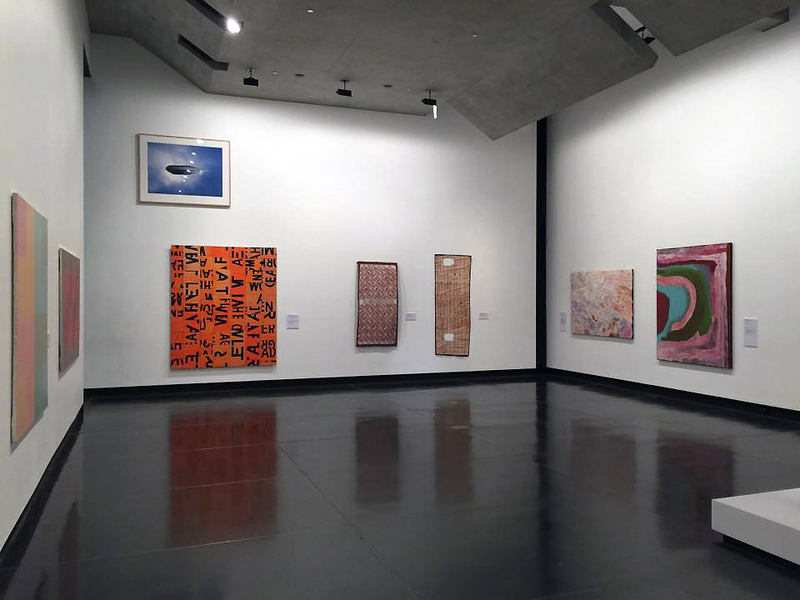 The exhibition, Luminous World: Contemporary art from the Wesfarmers Collection, presents a diverse selection of contemporary paintings, photography and works of sculpture. 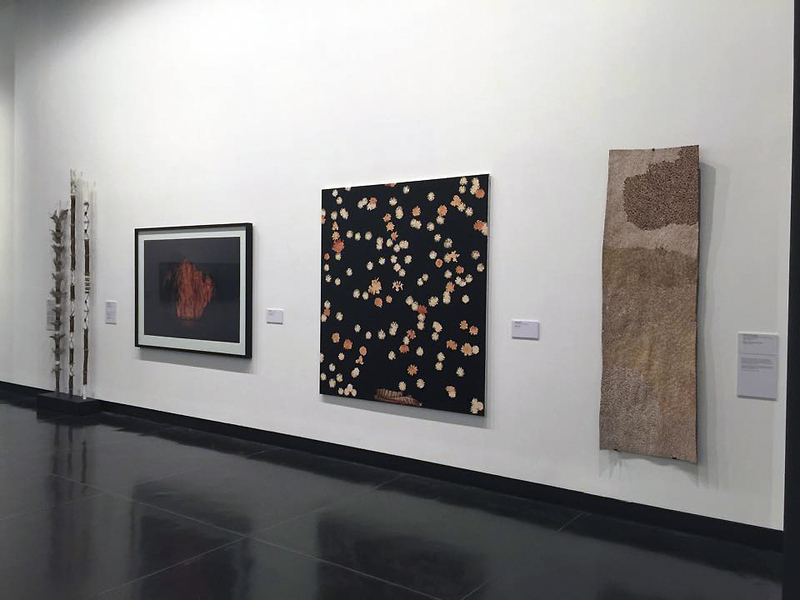 The works traverse a diversity of cultural, aesthetic and philosophical perspectives, with the curatorial premise of how contemporary artists explore the phenomenon of light in their work. 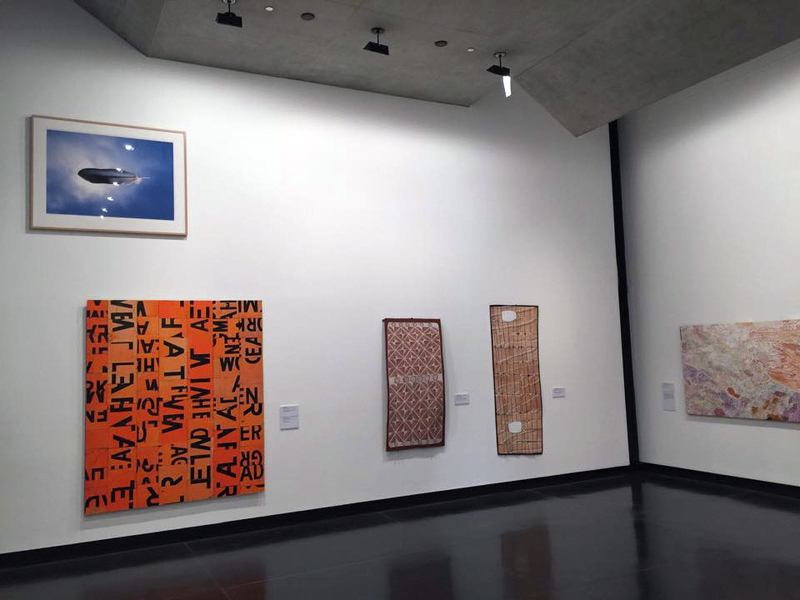 Some 50 artists from Australia and New Zealand are featured in the exhibition including: Susan Norrie, Rosemary Laing, Howard Taylor, Dale Frank, Paddy Bedford, Bill Henson, Fiona Pardington (NZ), Brian Blanchflower, Brook Andrew, Timothy Cook and Nyapanyapa Yunupingu. Included alongside the art is a major new body of poetry by John Kinsella, written in response to works in the exhibition. These are published for the first time under the imprint of Fremantle Press in the book Luminous World, with new writing by artist Bill Henson and composer Richard Mills. Ian Potter Museum of Art Director, Ms Kelly Gellatly said, “Luminous World highlights the strengths ofthe Wesfarmers Collection, which has generously been shared, through the tour of the exhibition, with the wider community. “In bringing together works across a range of media by Indigenous and non-Indigenous artists, Luminous World successfully showcases both the depth and continuing resonance of contemporary Australian practice in a rich, open-ended and exploratory conversation about light. “To know and experience light and its effects however, one must equally understand its other – darkness. Together, these concerns create an exhibition experience that is at once intellectual, emotional and experiential,” Ms Gellatly said. “For more than three decades Wesfarmers has been collecting Australian art. From General Manager John Bennison’s first acquisition in 1977 of a pastoral scene by the Australian impressionist Elioth Gruner, Wesfarmers’ purpose was to accentuate the value of art in the workplace and encourage and understanding of the importance to society of supporting creative thinking and artistic vision. The company has always been committed to sharing its collection with the community through exhibitions and loans and by opening our workplaces for groups to view the art in our offices. This is the first time Wesfarmers has showcased the contemporary art in the collection, and the works selected for Luminous World illustrate some of the ways in which the collection has grown in recent years. For instance, the inclusion of art from New Zealand, where Wesfarmers now has a significant business presence, and the heightened emphasis on representing the great diversity of contemporary indigenous art. 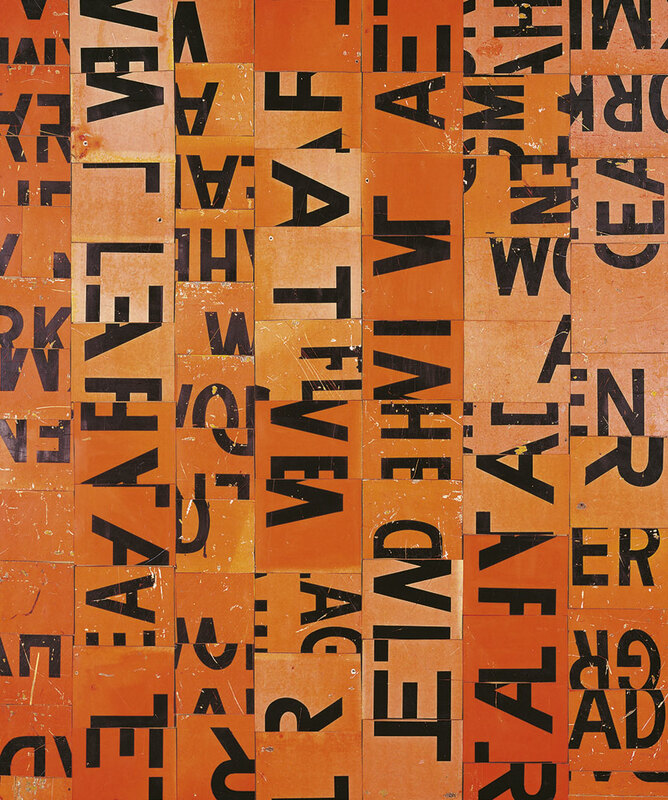 The visual world is defined by light; everything we see is processed by the eye as patterns of brightness and colour. Monumental formations in the landscape as well as the most subtle nuances of atmosphere are made real to us by the action of light, transmitted in wavelengths as an infinitely varied register of colour that combine within the eye to shape our sense of space and form. It is the action of light reflecting off, refracting through and being absorbed by the substance of the world that enables the eye to perceive contours, hues, and textures and mark the passing of time from day to night and season to season. 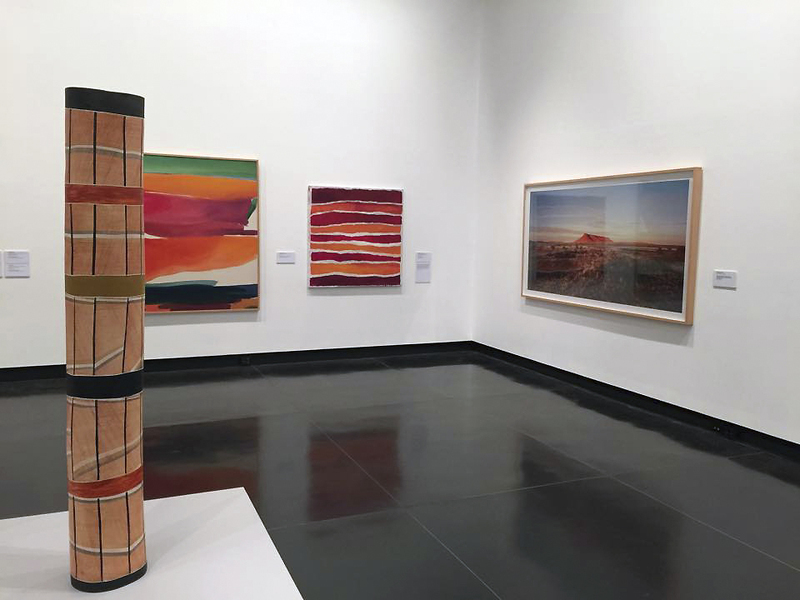 Luminous World presents a diverse selection of contemporary paintings, photography and works of sculpture, acquired by the Wesfarmers Collection over thirty years and considered through the lens of how contemporary artists variously utilise the phenomenon of light in their work. Rather than a chronological or stylistically ordered presentation, it follows a loosely intuitive flow of ideas and imagery moving through night to day. 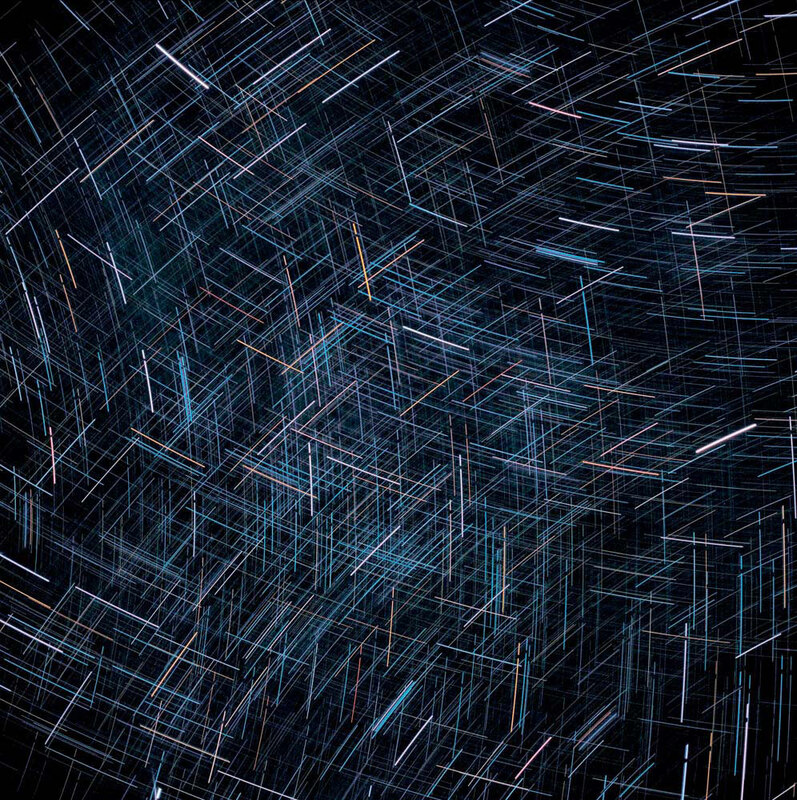 The artists in this exhibition explore light from the perspective of the optical experience, the connection between the stars and the cycles of life on earth; and from diverse cultural, mythic and spiritual point of departure. Published for the first time in the Luminous World catalogue are recent poems by John Kinsella, written in response to selected works in the exhibition, together with new writing by artist Bill Henson and composer Richard Mills that extend an artistic dialogue in which all can share. This painting depicts the country known as Parwalla, which is Nyumi’s father’s country. This country is far to the south of Balgo in the Great Sandy Desert, west of Kiwirrkurra, and is dominated by tali (sand hills). Parwalla is a large swampy area, which fills with water after the wet season rain and consequently produces an abundance of bush foods. The majority of Nyumi’s painting shows the different bush foods, including kantjilyi (bush raisin), pura (bush tomato) and minyili (seed). The whiteish colours, which dominate the painting, represent the spinifex that grows strong and seeds after the wet season rains. 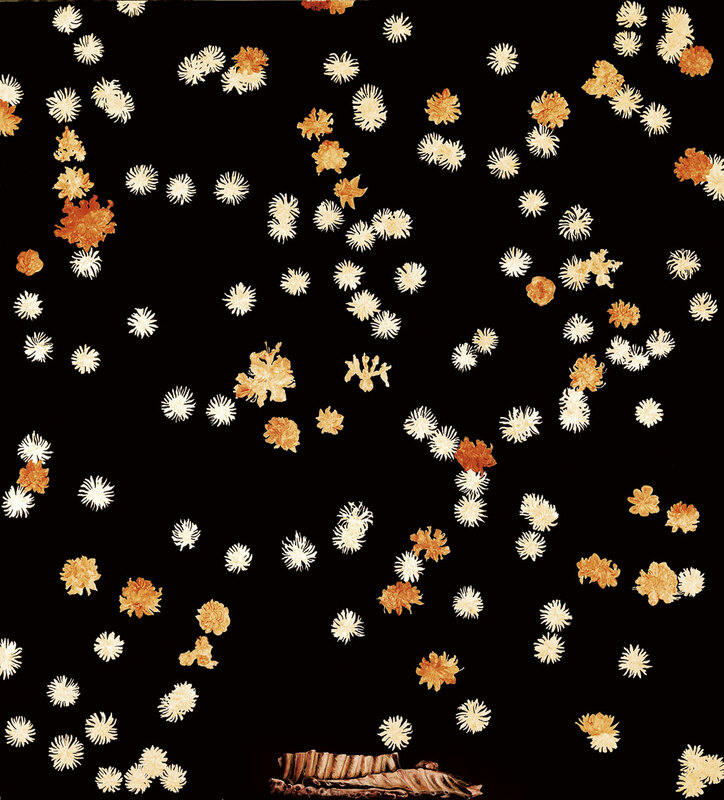 These seeds are white in colour, and grow so thickly they obscure the ground and other plants below. When Nyumi was only a very young child her mother died at Kanari soakwater close to Jupiter Well. As a young girl, Nyumi lived with her family group in their country. As a teenager she walked along the Canning Stock Route into the old mission with her father and family group. There she was given clothes and taken to Billiluna Station to be trained as a domestic worker and to work for the wives of the station managers around the region. Nyumi commenced painting in 1987 and emerged as a leading artist in the late 1990s. She is married to the artist Palmer Gordon and has four daughters, three of whom are still living and beginning to paint with strong encouragement from Nyumi. Her elder brothers Brandy Tjungurrayi and Patrick Olodoodi are both senior lawmen and recognised artists. Nyumi is a very strong culture woman and dancer and an enthusiastic teacher of culture to children, ensuring the traditional dances and songs are kept alive. Nyumi’s paintings are mainly concerned with the abundant bush food in the country belonging to her family. 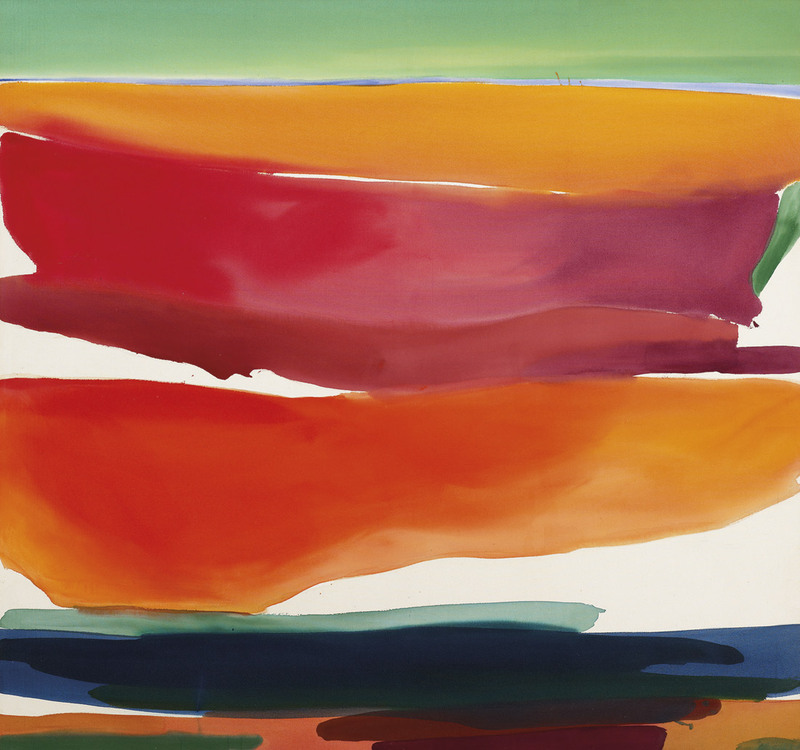 Initially, she worked with a thick brush, covering the canvas with fluent lines in tones of yellow, green and red. She has now developed a strong personal style of thick impasto dotting, to build up fields of texture heavily laden with white, in which motifs of camp sites, coolamons, digging sticks and bush tucker stand out. Brumby mound #5 2003 is one of a series of photographs by Rosemary Laing that explores the way European culture has often been uncomfortably imposed on an ancient land. 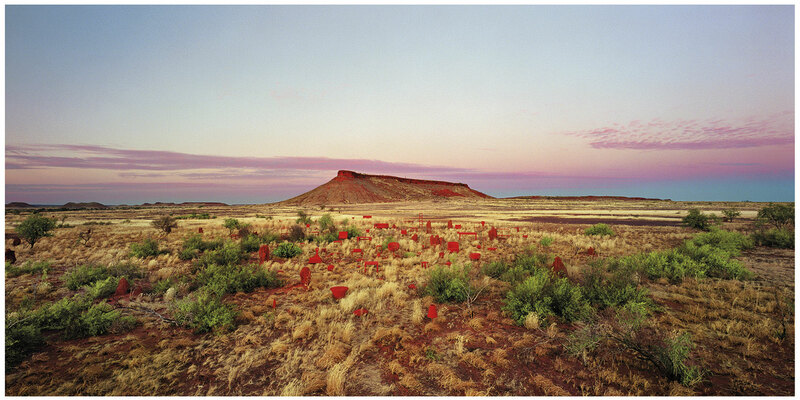 Laing chooses a desert-scape that many identify as quintessentially Australian as the setting for her interventions. The location is the Wirrimanu community lands around Balgo in north-east Western Australia. Onto these traditional lands Laing has incongruously placed items of mass-produced furniture painted to mimic the surroundings. 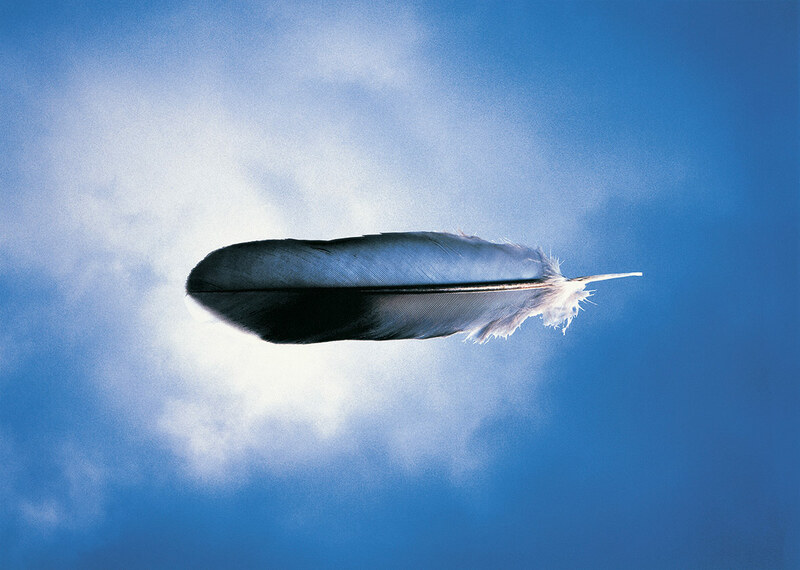 “Feathers float – so do clouds – and dreams. Feather – a Wiradjuri word for feather and wing are the same, Gawuurra. Probably Cowra, the name of a town to the south, comes from this. In contemporary Aboriginal practices of other groups, feather-appendage is extended in meaning to string tassel, sacred string marking a journey, connecting landscapes, people, family lineages, and, importantly, the embryo cord linking child and mother. A wing of the eagle hawk, Malyan, a skin name, a scary dream-being overhead. Is it guardian angel or assassin? In the south-east, a feather left behind is often evidence of such a spiritual visit. Through the large, simply superimposed images of cloud, Michael was trying to minimalise things, to distil his ideas about physical reality and spirit. All are dichotomously connected to Dubbo and Riley and are also universal. They are not about a place but a state, the surrealistic cow with mud and manure on its hoofs floating by. In contrast to Empire’s scenes of a decayed, overworked and desolated landscape, there is no physical land in the cloud imagery. Extract from Djon Mundine. 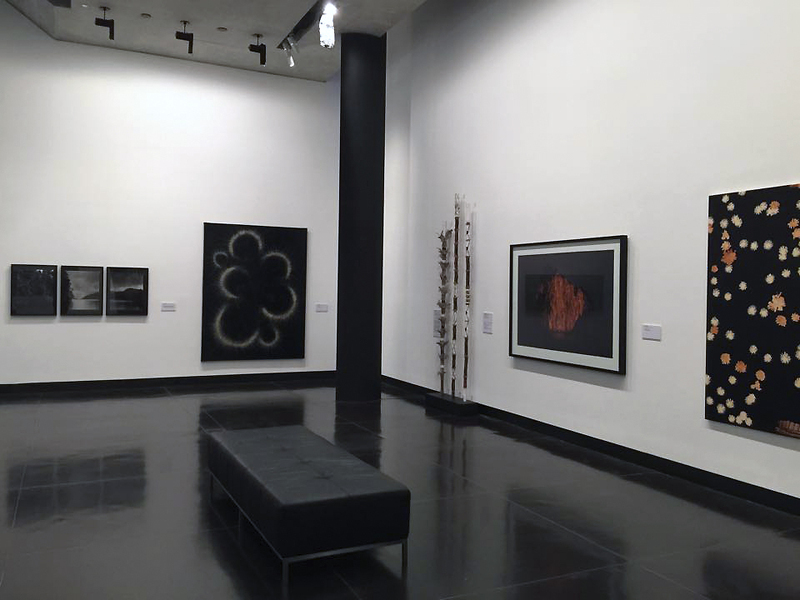 “Wungguli – Shadow : Photographing the spirit and Michael Riley” on the Michael Riley: sights unseen National Gallery of Australia website. “Paddy Bedford was a senior Gija lawman born at Bedford Downs Station in the East Kimberly region. Like many indigenous artists, he lived a long life as a stockman before he looked upon the Turkey Creek elders – Rover Thomas and Paddy Jiminji – to begin painting. Bedford’s first works were made with the inception of the Jirrawun Aboriginal Art Cooperative in 1997. 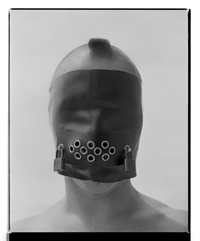 The distinctive minimalist style of his work is but a mask to the multifarious layers of meaning. 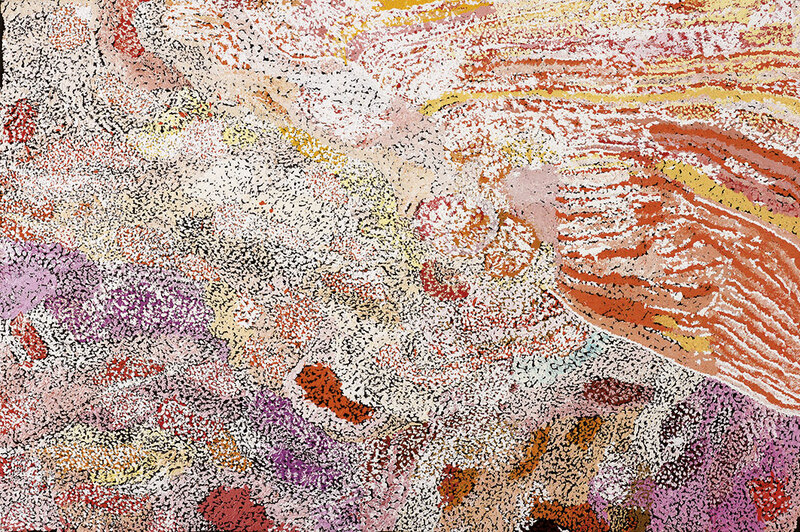 Bedford’s paintings are inspired by the distinctive landscape and stories of his country in the East Kimberly region of Western Australia, as he depicts from an aerial perspective the traditional dreamings of the Cockatoo, Emu and Turkey; the massacres of local Aboriginal people during the colonial period; as well as episodes from his own life as a stockman and as a senior elder of his community.